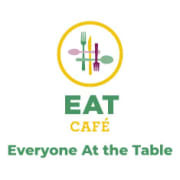 The EAT Café was founded by the Center for Hunger-Free Communities at Drexel University in collaboration with West Philadelphia neighborhoods. This project began with support from the Pierce Family Foundation, the Vetri Community Partnership, and Drexel’s Center for Hospitality and Sports Management. In Philadelphia, nearly 1 in 4 people is food insecure. We address food insecurity by providing nutritious, high quality meals to all who walk through our door. We craft meals made from scratch with fresh ingredients that are locally sourced whenever possible. EAT Café is located in West Philadelphia, at the intersection of seven vibrant and diverse neighborhoods. As a community-based restaurant, the EAT Café provides a welcoming space to nourish the community through good food and fellowship. In addition, we engage the community through various activities, events, and educational programming. Future programming will include culinary arts and workforce readiness training. Would you recommend EAT Café (Everyone At the Table)?